Although Cassini is gone, it has dramatically changed what we know of Saturn and its moons. And while we know a lot more about the system, there are new mysteries that will have to wait to be solved. Among them is whether or not a possible moon nicknamed Peggy is actually forming within its rings. The moonlet's existence is estimated from disturbances in the rings, which was first seen by astronomer Carl Murray, a scientist from Queen Mary University of London. 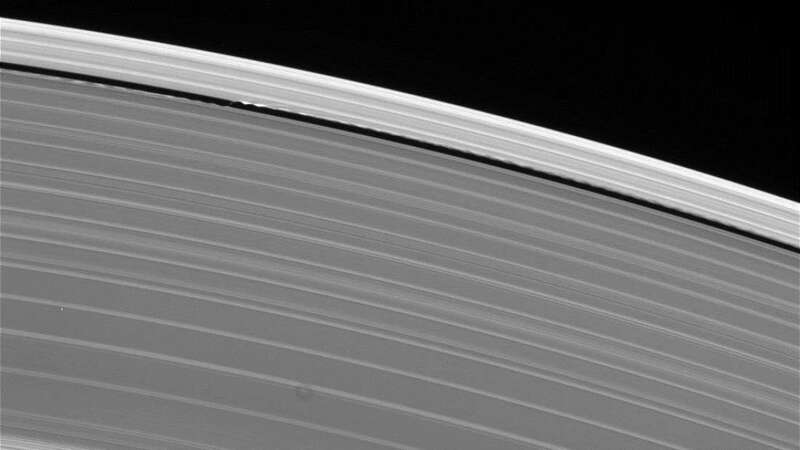 These waves in the rings have been associated with the shepherd moons, small satellites that inhabit the rings and help keep them stable. In 2013, Murray noticed new wobbles, but no moon. Over the next few years, researchers have been going through the Cassini images to get as much info as possible on this object. The team has never resolved the object, but based on the size of the disturbance, it would be very large. This suggests that it’s likely a big cloud of debris at the moment, and that it’s quite active as it might have split in two a few years ago. “When Cassini came out of its ring plane orbit in early 2016, we went back to look where Peggy should be; and we found Peggy and we've been tracking it ever since,” Murray told BBC News early this year. Peggy is named after Murray’s mother-in-law as he discovered it on her birthday. If the latest data doesn’t provide new clues, it might take decades before we have an answer regarding Peggy. There are several new missions that propose going back to Saturn, but none of these have been approved yet.